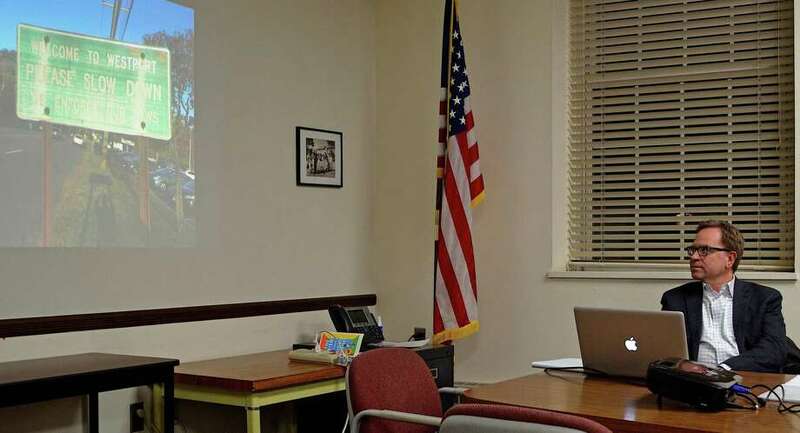 Glen Swantak, principal of Merje of Westchester, Penn., shares a photo of a first impression of Westport at the Wayfinding Information Session at Town Hall, Tuesday, Feb. 26, 2019, in Westport, Conn.
WESTPORT — The Wayfinding Steering Committee is seeking public input for the Downtown Wayfinding Project through a survey. The committee is working with Merje, a national wayfinding design firm tasked with creating a master plan for downtown Westport and the gateways to town. The aim is to help guide motorists and pedestrians to popular attractions, parking and destinations. Merje is currently working on the wayfinding analysis element of the program, which will identify town gateways and destinations, and will provide initial recommendations on digital tools, and best practices for signage type and location. The information collected from the survey will assist in the analysis and in creating schematic designs to be presented to the steering committee. Glen Swantak, principal of Pennsylvania-based Merje, shared first impressions of Westport at a Wayfinding Information Session in February. “At its core this is a marketing project,” Swantak said during that presentation. Merje has created wayfinding infrastructure for many large and small municipalities, including New Orleans, Miami Beach and — in Connecticut — New Haven and Norwalk. The survey will be open until April 17.